This one is going to Shopping our Stash-He Loves me He loves me not - Make a Valentine Card or Project. This one might be my favorite of the three cards I see posted overnight. Love the round shape! agree with Heidi - this is my favorite of your nighttime crafting - that is such a pretty stamp and done totally in a circle is especially pretty. are you going to take a long nap today?? Wow, wow, wow! This is one gorgeous card, my friend! Fabulous color combo & love the round card shape! This card is AWESOME! 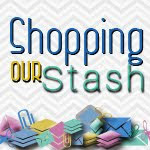 OMG, I just saw it in the link-ups at Shopping Our Stash and I am so glad you joined... well, kind of not because now I am jealous and need that background!!! Just kidding, but you know what I mean! Ooooh, that's so pretty! What stamp is that? I believe it is Simon Says Stamps Cora background.